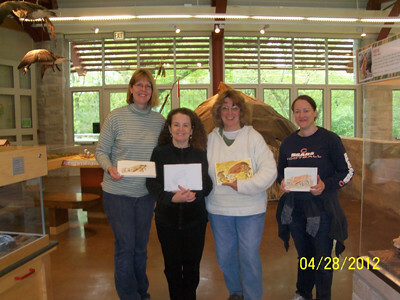 Sketch Class Results April 2012 – Let's Paint Nature! 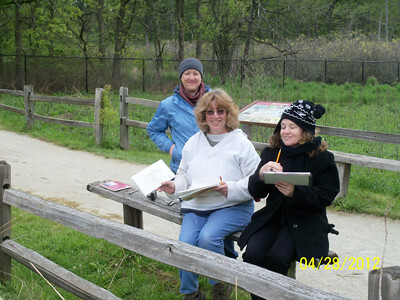 Last Saturday a group of us met for another Little Red Schoolhouse Sketch Class. 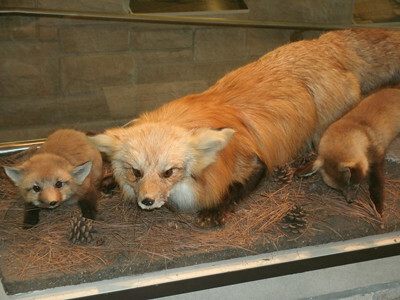 Because of the recent rains, we knew that if we painted outside our watercolors would take forever to dry, so we decided to start with an indoor sketch of the fox family display. We went slow…step by step…and boy did they turn out great! Did I ever tell you how difficult still life could be compared to landscape? Yes sir…but the artwork is fantastic. The end result is not the goal. It’s all about the process! We are documenting our view and our feeling when we experience nature. They are all unique and beautiful in their own way. One student said that her friend was interested in attending the class but couldn’t gather enough courage. 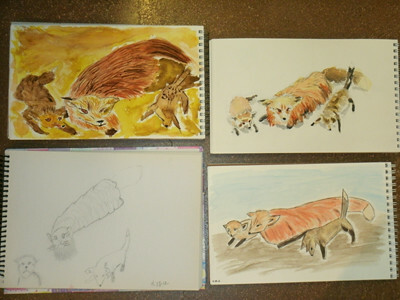 I replied, “There is NO COURAGE REQUIRED for sketch class!” Everyone is welcome even if you’ve never painted before. 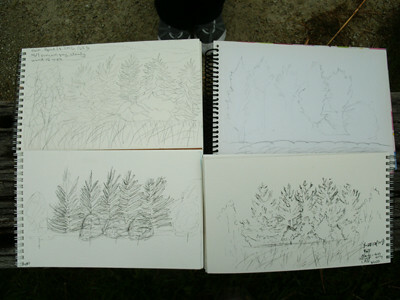 After we painted the fox family display, we decided to take our sketchbooks and a micron pens with us on a short hike, to draw the pines along the field at the beginning of the Black Oak Trail. 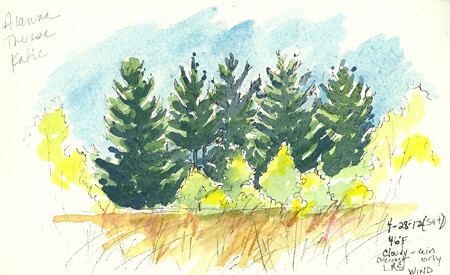 Here are the pines we wanted to sketch. We sat down and got right to work. Because we were not using color, we focused on lines. Which way are lines going in the pines? 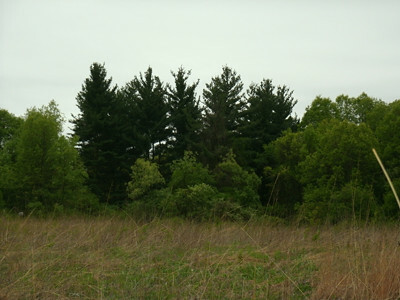 What different lines do the pines have that the trees in front do not? Those are some of the questions we asked as we drew our sketches. It’s hard to see, but here are our simple black micron drawings. Another great sketch by the class! I went home and added some color from memory. That was fun and relaxing because I didn’t care if my colors matched at all! 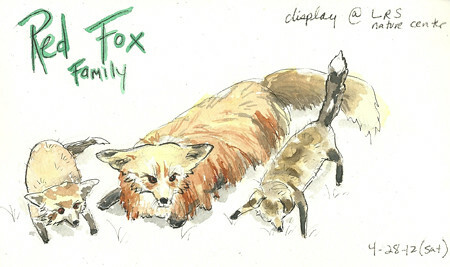 And here is a close up of my fox family watercolor sketch. I hope you enjoyed April’s sketch class results. Maybe you would like to join at the end of May? I would love to join the sketch class at the end of May. When is it? Where? And, what is the cost? Please let me know. Great to see such smiling faces after a sketch well done. And boy, do you have the right attitude: the process is the thing. If we just focused on the results, we’d never make any progress (or have any fun). And there’s a lot to be said for applying color from memory– call it intuitive color– you can get some fantastic results that way.